Big game fishing has been practised as a recreational sport for some time now. Lured by the excitement of catching fish that can sometimes be as huge as humans, participants in this sport are known to take their expeditions to remote and far-flung locations, as they chase the biggest catch. If you feel like this is the sport for you, then there are a few things that you have to master to be able to succeed. The first thing is to make sure that you have the right fishing equipment. These giant sea creatures are very strong and they can easily break their hold and free themselves. You should also use the right lures, as failure to do this may end up with you catching nothing at all. There is a lot that you have to consider before embarking on a big game fishing expedition. Key among these factors is the right location. These creatures are found in specific locations in the sea and you will definitely have to set sail to increase your likelihood of catching any fish. All the sports fishermen will tell you that nothing beats catching a blue marlin when it comes to big game fishing. 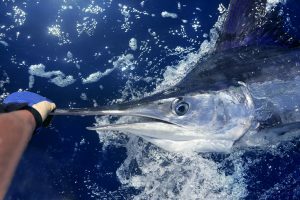 Anglers the world over ponder over the question “where to catch giant blue Marlin?” and it is only after figuring out the answer to this question that you should embark on big game fishing. The various locations where you can find the blue marlin include Cairns in Australia, the pacific waters of Kona Hawaii, Madeira Portugal, as well as Tahiti and French Polynesia.